A $50 food credit available for use in The Grill, Mansion Lounge, Market and Bakery, Room Service, or the Spa Café (one $50 credit per stay). The Spa Getaway Package is based on double occupancy – for each additional guest, there will be an additional cost. Rate does not include taxes, gratuities, or a $25 nightly resort fee. Not applicable to group or wedding attendees. Cannot be combined with any other offer or discount. Non-retroactive rate. Unused package components will not be refunded. 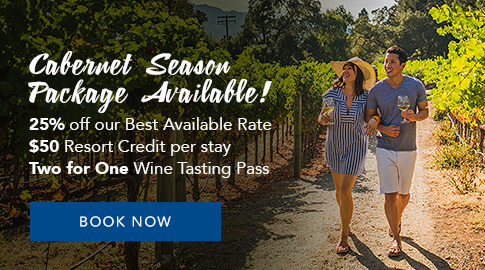 Slip away to wine country for a romantic retreat. Escape to Silverado with your loved one. This package includes a 50-minute spa treatment, one round of golf on a PGA course, and a $50 food credit. The Couples Escape Package is based on double occupancy and does not include taxes, gratuities, or a $25 nightly resort fee. Not applicable to group or wedding attendees. Cannot be combined with any other offer or discount. Non-retroactive rate. Unused package components will not be refunded. Cancellation Policy: 7 days prior to arrival to avoid a charge of one night's room, tax, and resort fee. Early Departure Policy: Guests who depart prior to the confirmed reservation end date will be charged the last night’s room, tax, and resort fee.